Ask us about our Pro-Series finishes to bring character and creativity to your next project! Specialized decorative render finishes that can bring depth and texture. Industrial or earthy, natural or contemporary - there is a render finish that can enhance your architectural style and the possibilities are endless. The creative world of render. Our Pro-Series aims to give our clients more options and really showcases how render can be used creatively, utilizing the beautiful natural materials and decorative finishes that are now available in the architectural coatings field. An added benefit of natural material finishes is that they are based on clay or lime and are free of dangerous chemicals, producing no odors or residual off-gassing. 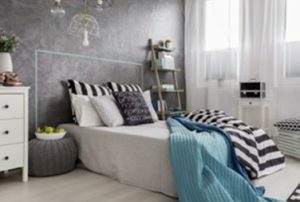 Recent years have seen a trend emerge in which rendering is being used to feature internal walls, is being used in bathrooms and kitchens and now offers a very broad range of creative finishes. The mood and character of a room can be completely changed just by adding an interesting and textured render feature. These beautiful and unique finishes can also be used on external features producing some amazing results. Working with some of these natural materials, such as ROCKCOTE Venetian Plaster or Marrakesh, is a highly specialized skill that requires product-specific training and these finishes can only be applied by trained Artisans. Jared is a certified Artisan, he has had comprehensive training in the application of these materials and is part of a network of skilled craftspeople, able to offer these finishes. Render-vations Pro-Series Finishes currently includes ROCKCOTE Venetian Plaster, ROCKCOTE Marrakesh, ROCKCOTE Clay Plaster, ROCKCOTE Otsumigaki, German Smear, ROCKCOTE Concrete Finish and Natural Stone Finishes. You can find more in depth information on these finishes on our Products and Finishes page, and also through our useful links.